I was vividly reminded of this on my recent road trip to Pittsburgh. We drove interstate highways that are some of the major trucking corridors in the US, through stunning scenery, and lots of weeds. It was a long drive, so we stopped often at the well-kept and inviting rest stops, where I could look at the weeds up close. It was clear that, while mowed and groomed, the grounds weren't sprayed or doused with chemicals, since healing and helping herbs were in multitudes. This week's weed walk shares the abundance of medicinal and edible plants thriving in the most common of places: what botanists call "disturbed areas." While I obviously prefer to harvest my plants in less disturbed places, I would not hesitate to pluck a plantain leaf from anywhere to put on a bee sting or a scrape. I would not hesitate to chew up a dandelion leaf from anywhere at all to soothe an upset stomach. Healing herbs grow in disturbed places to be of service. 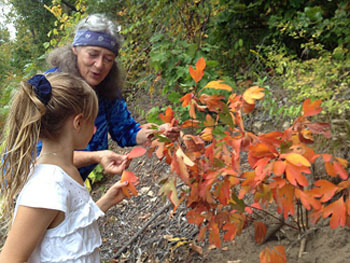 When we recognize the powers of the plants in our backyards, the plants rejoice. Herbal medicine is people's medicine; it's the medicine that's right outside your door. And green blessings are everywhere. 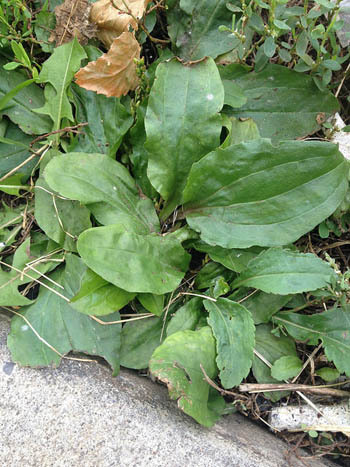 Plantain is most at home in disturbed places, especially places where people walk. Here is a shot of a study plantain crowding up against the pavement's edge at the visitor's center. And here is a shot of a plantain proclaiming herself in the lawn, with lots of ripe seed clusters just waiting to be harvested. 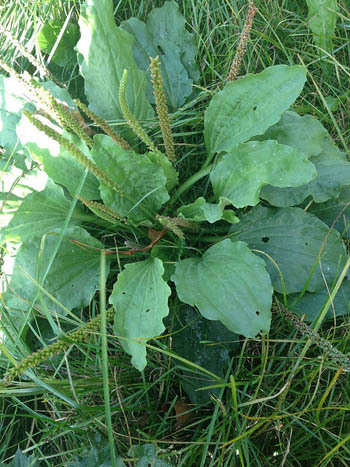 There is nothing better than plantain to stop swelling and pain from a bee or wasp sting. In fact, all boo-boos – scrapes, wounds, rashes, blisters, even bullet holes – feel better and heal faster when treated with plantain. The queen of the disturbed places we call lawns is dent-de-lion. 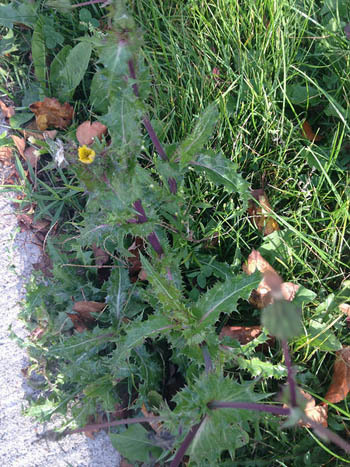 One photo shows a late blooming dandelion, with stubby leaves. Just across the way was another dandelion, one who was reserving her strength, feeding her roots, and exuding a loud "Eat me!" message. 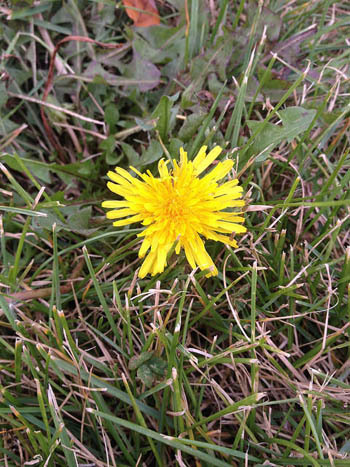 I think it is clear that we would choose the latter dandelion, the non-flowering one, for our medicine and our food. 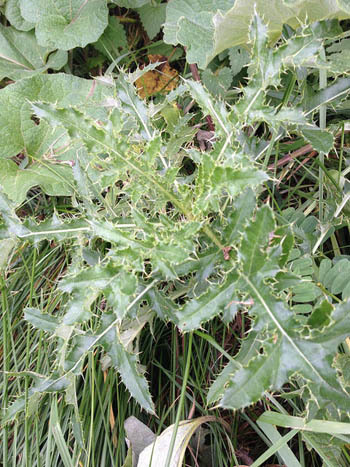 This relative of dandelion has leaves that make it look like a thistle, until you see the flowers. I found it growing happily here and there at the disturbed places we visited; always one or two, never in patches. In New Zealand, she is known as poo-haa, and treasured as an edible green. In fact, all members of the dandelion tribe are edible, though some are too bitter to be palatable. 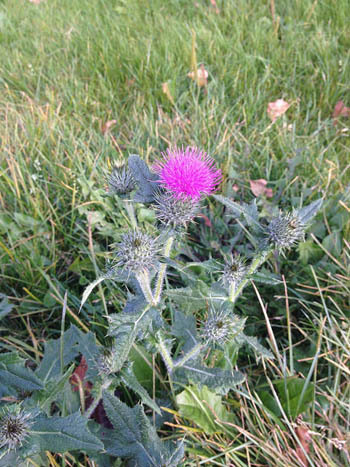 This is the common field thistle, but a species identification is not really needed when it comes to thistles, which are easy to recognize by their spiny leaves and fancy flowers. 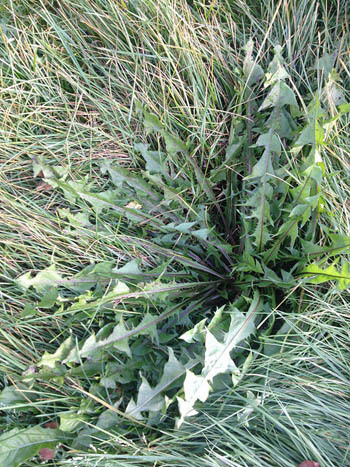 All thistles are used in much the same way. Milk thistle seed is the one we all turn to for liver help, but the entire tribe of thistles is always ready to provide food and medicine. A pair of scissors is helpful in cutting the spines off the leaves before eating them. The roots are often sweet and tasty baked. 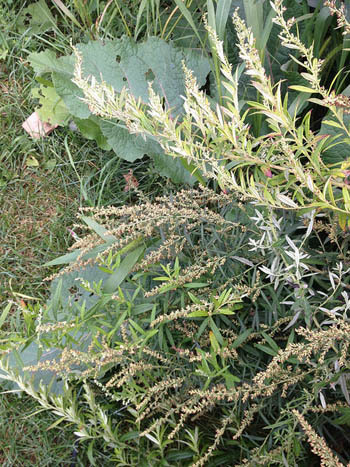 A biennial plant whose first-year root, tinctured, has become famous as a "cure" for Lyme disease. These are the seed heads, found on the second-year plants. 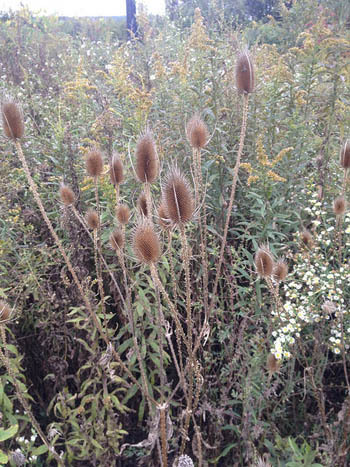 Teasel leaves, like those of sow thistle and those of field thistle, are spiny, but not cut at the margin. The name sylvestris, means "of the woods," just as Pennsylvania means "Penn's woods," (Penn- sylvania). 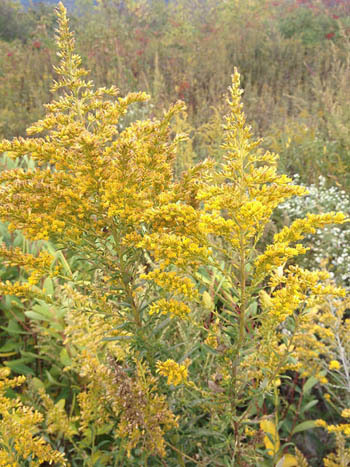 I like to make a jar or two of goldenrod vinegar as a fall tonic. The taste is earth-y and pollen-y and sunshine-y. The goldenrod is a late fall favorite of so many insects, I figure it must offer something special, something special to help us all through the winter that's ahead. While goldenrod flowers do sometimes find their way into my salads, I find their texture less than friendly. Lovely companions, these two. Both grow world-wide, and both are recognized as powerful healers. Burdock root is one of the roots we dug this past weekend, at our Hands-on Digging Roots Workshop here at The Wise Woman Center. We will use the vinegar we made as a winter tonic and save the tincture we made for dealing with specific problems. Cronewort was one of the stars of Magical Plants, one of classes I taught last month. And one of the plants in our Third Eye Opening Blend, which will be ready to use in just a few weeks, if you made your flowering cronewort tincture a month ago. There was but one patch of catnip that I saw, but it was vibrant and lush, though growing in one of the more disturbed areas of the largest rest stop that we visited. 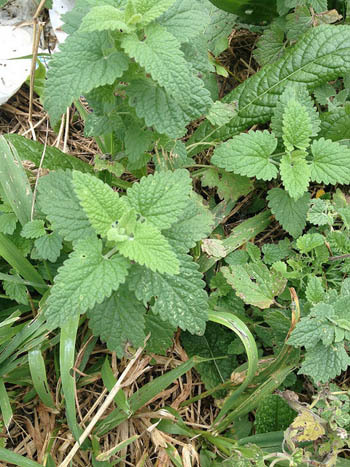 Small doses of tincture of catnip flowers (see next photo) is somewhat successful in helping those with ADHD. 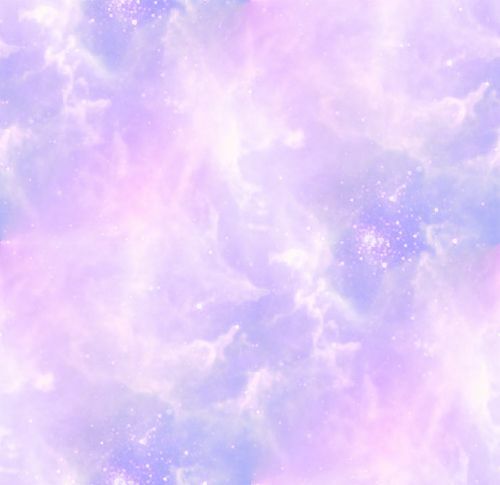 Larger doses can be remarkably sedative. Here is the big picture, the whole gang as I found them. 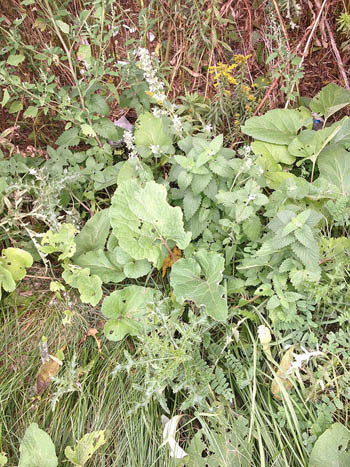 Look closely and you will see burdock, catnip leaves and catnip flowers, sow thistle, goldenrod, and even some lamb's quarter in the background.